Audio Recordings of L. Neil Smith reading two of his essays. 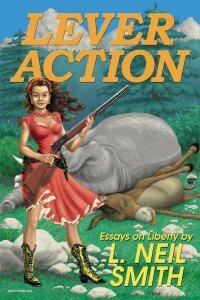 If you like L. Neil Smith's books, look at all this other cool individual liberty stuff you can get here for free! Who Is L. Neil Smith? People accuse me of being a single-issue writer, a single- issue thinker, and a single- issue voter, but it isn't true. What I've chosen, in a world where there's never enough time and energy, is to focus on the one political issue which most clearly and unmistakably demonstrates what any politicianor political philosophyis made of, right down to the creamy liquid center. Make no mistake: all politicianseven those ostensibly on the side of guns and gun ownershiphate the issue and anyone, like me, who insists on bringing it up. They hate it because it's an X-ray machine. It's a Vulcan mind-meld. It's the ultimate test to which any politicianor political philosophycan be put. If a politician isn't perfectly comfortable with the idea of his average constituent, any man, woman, or responsible child, walking into a hardware store and paying cashfor any rifle, shotgun, handgun, machinegun, anythingwithout producing ID or signing one scrap of paper, he isn't your friend no matter what he tells you. What his attitudetoward your ownership and use of weaponsconveys is his real attitude about you. And if he doesn't trust you, then why in the name of John Moses Browning should you trust him? If he makes excuses about obeying a law he's sworn to uphold and defendthe highest law of the land, the Bill of Rightsdo you want to entrust him with anything? If he ignores you, sneers at you, complains about you, or defames you, if he calls you names only he thinks are evillike "Constitutionalist"when you insist that he account for himself, hasn't he betrayed his oath, isn't he unfit to hold office, and doesn't he really belong in jail? Sure, these are all leading questions. They're the questions that led me to the issue of guns and gun ownership as the clearest and most unmistakable demonstration of what any given politicianor political philosophyis really made of. He may lecture you about the dangerous weirdos out there who shouldn't have a gunbut what does that have to do with you? Why in the name of John Moses Browning should you be made to suffer for the misdeeds of others? Didn't you lay aside the infantile notion of group punishment when you left public schoolor the military? Isn't it an essentially European notion, anywayPrussian, maybeand certainly not what America was supposed to be all about? Try it yourself: if a politician won't trust you, why should you trust him? If he's a manand you're notwhat does his lack of trust tell you about his real attitude toward women? If "he" happens to be a woman, what makes her so perverse that she's eager to render her fellow women helpless on the mean and seedy streets her policies helped create? Should you believe her when she says she wants to help you by imposing some infantile group health care program on you at the point of the kind of gun she doesn't want you to have? On the other handor the other partyshould you believe anything politicians say who claim they stand for freedom, but drag their feet and make excuses about repealing limits on your right to own and carry weapons? What does this tell you about their real motives for ignoring voters and ramming through one infantile group trade agreement after another with other countries? Makes voting simpler, doesn't it? You don't have to study every issuehealth care, international tradeall you have to do is use this X-ray machine, this Vulcan mind-meld, to get beyond their empty words and find out how politicians really feel. About you. And that, of course, is why they hate it. Permission to redistribute this article is herewith granted by the authorprovided that it is reproduced unedited, in its entirety, and appropriate credit given. Winner of Free-Market.net's Freedom Book of the Month Award for May 2001. Welcome to L. Neil Smith's Home on the World Wide Web! Originally published by Del Rey Books, 1984 (now out of print). 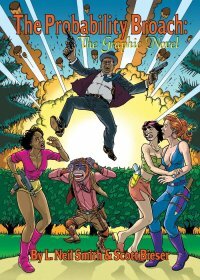 First uncensored edition republished as a downloadable .pdf eBook by L. Neil Smith in 2005 (now out of print). NOTE: Back in Print! from Arc Manor Publishers under their Phoenix Pick imprint. Published by Bighead Press, November 2004. 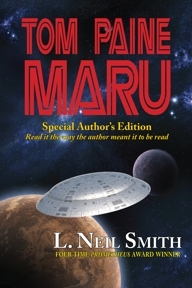 Trade paperback, published by Tor Books, December, 2001 (First published by Random House, 1980, reprinted by Tor Books, 1996). Winner of the Prometheus Award from the Libertarian Futurist Society (best Libertarian Science Fiction Novel of the Year) for 1980/81; widely considered the definitive libertarian novel. Winner of Free-Market.net's Freedom Book of the Month Award for August, 2001. Hope was designated the "Freedom Book of the Year for 2001" by Free-Market.net. Winner of Free-Market.net's Freedom Book of the Month Award for July, 1999. Let the hysterics foam and froth. It keeps them from doing more disgusting things. That individuals have rights, not privileges isn't just an idea, it's a fact of objective reality. Let the hysterics be afraid. It's time for them to be afraid. To withhold the truth because you're worried about the reaction of the weakest, stupidest, or most ignorant or corrupt among us -- especially when that truth is exactly what we need to set us free - would be an act of cowardice or insanity. It would mean that we deserve to be where we are now instead of where we aspire to be. It would be the act of a slave. PUBLIC NOTICE: henceforward, I shall be calling the cartridge formerly known as ".40 S&W" by a new name -- ".40 Liberty" -- to disassociate one of the greatest implements of self-defense ever conceived from the cowardly corporation doing its best to eradicate the very concept of self-defense, and to remind everybody to boycott that corporation and interdict its sales to all government agencies.